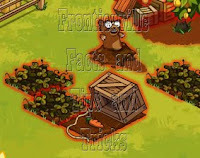 Right, I hear you young-un's have been having trouble trapping them damn Groundhogs with them new fangled trap things. Pah, I remember when I were your age we didn't have any of these fancy gimcrackeries to help us out, we worked for it! If I had a Horseshoe for every spade I've dented on the skull of a hog I'd be able to retire! But, you youngsters like your little gidgetty things so I thinked to myself it's time I told y'all the best way of using them. As you be a newbie, let's start with the basics, Groundhogs go in't the trap when they smell the food, and they's gotta be within' sniffin' distance, so remember to check yer perimeter. When you just be puttin' carrots in it won't be much, and we'll just concentrate on them there basic traps for now, not the upgraded ones you get yerself with some engineerin' buddies. That's not a job for a hardy pioneer, fiddlin' with ropes. 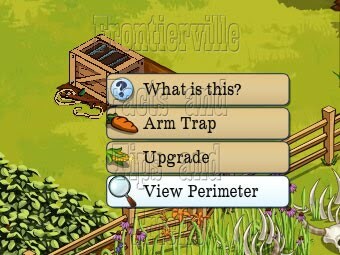 So, click yerself on that there trap and select "View Perimeter" and it'll give you a big green view of where the groundhog'll be able to sniff out that bait. 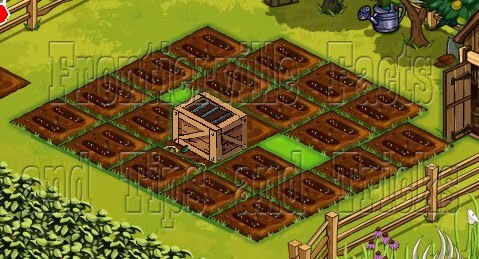 Now, this be a good crops setup to get the most crops inside the perimeter, they don't need to all be inside, as long as an edge be in the hog'll sniff out that carrot! So, you got them there crops set up, so what's next? Well, y'ave to ARM the trap, although that does take up 1 of them there energy points as it takes some work to get it balanced just right. 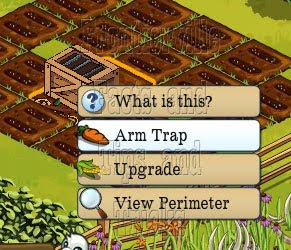 Make sure you be arming it BEFORE you go harvesting them crops because there aint no use in arming the trap when a hog is already above ground, they may be thicker than Hank's custard but even them hogs aint dumb enough to go sauntrin' into a trap they've gone and watched you lay! So, once that there trap is armed just harvest the crops around it and watch for a hog to pop up, if it turns your trap read then Honest Bob's yer Uncle (he might well be, he gets around that man) and you'll be seein a pair of beady little eyes starin' out at you quicker than it takes Bess to get on the cart when someone goes mentionin' a shoppin' trip into the big city. Oh, and just you remember, hogs aint all nasty creatures, they be misunderstood a fair bit too. I reckons on average one in ten will turn out to be a nice lil chap that you can keep as a pet or offer to one of yer friends. The good natured ones don't go eatin' yer crops if you look after 'em! So, whatcha waitin' for? A song and dance routine? Git yerselves out there and be trappin some Groundhogs! Adobe Flash Player is separate from your browsers cache and is required to play FrontierVille. Often times the Flash player has cached an out-dated version of the game. Clearing this from time to time can help with laggy play and things disappearing from your game.. In clearing this, it will force your browser to load the most current game from the Zynga servers. 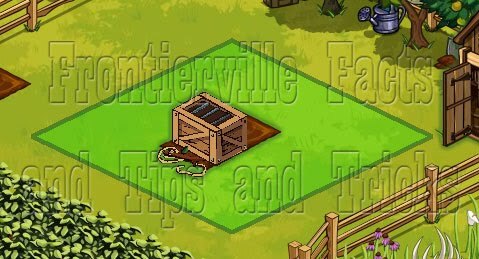 Clear your Flash Cache by going here and choosing to "delete all sites" or scroll and find "assets.frontierville.zynga.com" and "delete website"
Scroll to "Privacy Settings" and click on it. Locate "Block Lists" on the bottom middle of the page. Click on "Edit your lists". Scroll down to "Blocked Apps" and find "Frontierville" in that list. Click "unblock" if found. **If not found than it is a deeper problem that needs to be solved by Facebook..